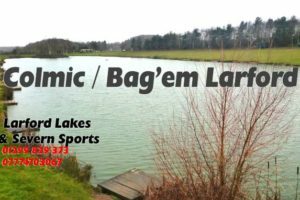 Conditions for round two of the winter league were cold with highs of just 9C on the Match and Specimen Lakes for the 11 teams (44 anglers). Heavy wind and strong showers made for difficult presentation on the pole. Heavy overnight rain had also dropped the water temperature and the colour had dropped out of both lakes. Individually, some good weights were still recorded with the overall winner Neil Colcombe (HT Bait Tec) recording a superb 155-02-00 from peg 64 on the Match Lake. Neil fished the pole down the edge and short with pellet and corn netting a superb bag of carp and F1’s. Second on the day was Mark Hawthorn (HT Bait Tec) who drew end peg 30 on the Match Lake. Mark fished tight to the lily bed and short with pellet and corn to land 145-07-00 of carp and F1’s. Third on the day was Kev Hayes (HT Angling Black) who drew peg 24 on the Match Lake. He also fished hard pellet long and short netting 111-08-00. Fourth placed Ian Giddins (Bag’em Winter Wonders) drew peg 22 on the Match Lake landing a level 94-00-00 Ian caught on the pole and pellet long and short. Fifth to the frame was Max G from peg 24 on the Specimen Lake. Sixth overall was Steve Rocke (HT Bait Tec ) from peg 58 on the Specimen Lake. Steve caught on the method and pole weighing in 91-03-00 for a section win.